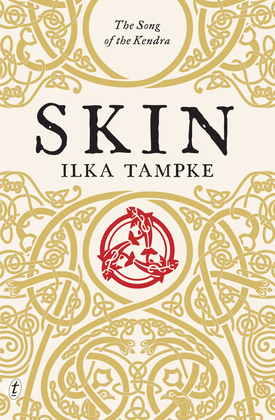 Synopsis: For the people of Caer Cad, ‘skin’ is their totem, their greeting, their ancestors, their land. 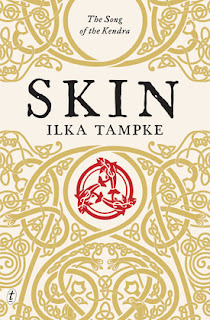 Review: I'm very glad that I picked up and read skin when I did as it was very different to what I've currently been reading and it was great to have this change across the board. Pace, setting, story...cover! LOOK at that gorgeous cover, and the foil on the hardback (which will have to be imagined) makes it look so beautiful. I also love Celtic patterns and gives you a great idea of what to expect...yet not at all. There was a great fluidity to the writing that drew you in and reminded me of when I read Hannah Kent's Burial Rights. Similarly, the pace of both books was more subtle, and events just flowed so it was about the little moments and what they meant on the grand scheme of things than this massive action-packed book, because you didn't need any of this. I loved the concept of Skin as an identity and a defining point of someone's life and how this was then also defined by certain animals. In many ways it still exists with the way that we hold onto traits like names, or geographic identity, just, we are not as controlled by it in the way that the characters are in the book. I think this is one of the reasons that I drew into Ailia so much. She was a great protagonist. I also think I have a thing for cook mother type characters because I'm also drawn to them! but that's made a story for a different day. The history of the novel was balanced with the fantasy, which itself is interesting because it is based on the truth of the lore and philosophy that people of this time believed in. It just brought it into reality. The loved the journeying into the Mothers realm, it gave little sparks to the book that brought of the tension and the emotion because it developed Ailia and through that as we were almost one and the same with her, we too grew to break down the ideologies of her situation and stand at the brink of change...where will book two take us I now wonder and wait....apparently patience is a virtue.